Why Do Dogs Kick When You Scratch Them? No dog lover can resist doling out a good belly rub when their pup flops onto the floor and shows their stomach. It’s always your goal to find that magic spot that gets their leg moving like Thumper in “Bambi.” When you find it, and your dog’s leg starts going crazy, you assume you’re giving them exactly what they asked for. The secret most dog owners don’t know, however, is that kicking their leg during a belly rub doesn’t always mean the dog is having a good time. There’s a biological reason behind why they do it, and it might change everything you thought you knew about giving a good belly rub. Reflexes are involuntary movements that allow the body to react to something before the thought has time to reach the brain. Some reflexes are for balance, like the one your doctor tests by hitting your knee with their special hammer, and others are for survival and protection, like putting your hands in front of you when you fall or blinking when a bug flies into your eye. 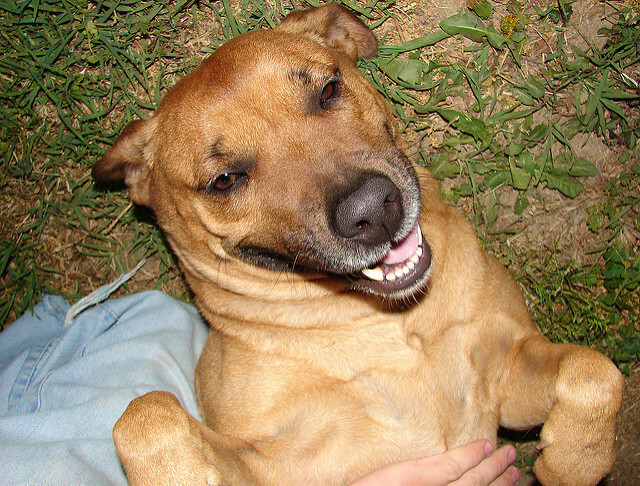 Dogs have reflexes too, and one of them is responsible for the belly rub leg kick. It’s called the scratch reflex, and according to Animal Planet, it’s what dogs do when something is irritating them. Under your dog’s soft belly skin, there’s a complex network of nerves. Those nerves communicate with the spinal cord to send a message to the leg that it needs to move. Researchers think its main purpose is to tell the dog it needs to scratch away pests that could end up causing them harm. It’s a command they have no choice but to follow, and they have no control over when it starts or how fast they kick. Do Dogs Even Like It? Now that we’ve compared your belly rubs to an irritating pest, you’re probably rethinking everything you thought you knew about your pet-pleasing skills. It’s easy to assume that a fast-moving leg is a sign your dog is enjoying their belly rub, but science says that’s not always the case. It’s like your doctor hitting your knee cap over and over. It doesn’t hurt, but it’s also pretty annoying. Some dogs only tolerate being scratched in that special spot because they’ve learned to submit to what their owners want. 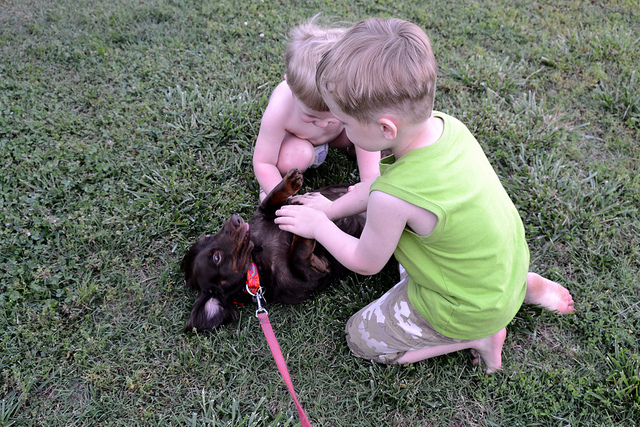 At the same time, however, there will always be dogs that LOVE belly rubs. They love them so much, they don’t care about whatever their leg is doing. Regular belly rubs (the ones that don’t involve leg kicking) are still enjoyable, and the feeling of their owner’s affection overshadows all else. To figure out how your dog feels about being scratched in their special spot, pay attention to the rest of their body language. If they try to move out of your way or roll back onto their stomach, that’s an obvious sign they’re not enjoying what you’re doing. Tensing their muscles, pinning their ears, and keeping their mouth tightly closed are also things dogs do when they’re uncomfortable or irritated. If your dog is happy to keep showing you their belly and lets their tongue loll out of their mouth, there’s a good chance they’re enjoying their belly rub as much as you think they are. They know they have your full attention, and there’s nothing better than that. There’s also the possibility they thoroughly enjoy the feeling of having their scratch reflex triggered over and over. To Rub the Belly or to Not Rub the Belly? As long as your dog’s body language is saying all good things, there’s no reason to stop doling out leg-kick-worthy belly rubs. Watch their facial features every time you do it, and remember dogs reserve the right to change their minds. They might have liked it yesterday, but that doesn’t mean they’ll feel the same tomorrow. For some dogs, it depends on how hard or how fast you scratch. They might enjoy a light tickle that gets their leg twitching, but many people try to get their dogs’ legs moving as fast as possible. They scratch harder and more vigorously, and that’s when a belly rub can shift from being fun to irritating. It can even be painful, like when someone tickles you in your extra ticklish spot and doesn’t stop. Scratching your dog’s already-itchy skin might sound like you’re doing them a favor, but it’s usually a bad idea. Scratching could make their condition worse and inflame the skin even after you walk away. Even if you didn’t know your dog’s leg kicks were due to an involuntary reflex, you’re the one that knows them best. If they have a habit of inviting you to rub their belly, they most likely know what they’re getting themselves into. The only problem with belly rubs is if you’re not correctly translating their body language. Read this article that talks more about how to tell what your dog is thinking. You’ll be able to use your new knowledge about body language the next time you’re faced with the soft expanse of your dog’s waiting belly.